February | 2010 | "組織搜索隊 , 到可能地區 , 作徹底搜尋。" February 2010 – "組織搜索隊 , 到可能地區 , 作徹底搜尋。"
I refer to the letter from Mary Chung, for the postmaster general (“Postbox too badly damaged”, February 18), in which she responded to my letter (“Historic mailbox’s last post”, February 11). Ms Chung talked of Hongkong Post’s commitment to the preservation of historic mailboxes in Hong Kong. While such commitment may in the first instance seem heartening, I am afraid when one looks at Hongkong Post’s record, one can’t help but think those are just empty words devoid of deeds. In a South China Morning Post (SEHK: 0583, announcements, news) report in March 2007 (“Keep historic mailboxes in service, experts urge”), Hongkong Post admitted that it had removed 86 historic mailboxes from the streets of Hong Kong in the 10 years since 1997. The number of these boxes in active service in 2007 then stood at 58. And now almost three years on, this number is further reduced to 47. This means 97 of the 144 boxes – or 67 per cent – that made it to 1997 did not survive Hongkong Post’s decision to have them removed. The sheer number removed should be enough to raise doubts about its commitment to the preservation of these boxes. These doubts are reinforced when you examine Hongkong Post’s justification for removing these boxes. In the 2007 report, a Hongkong Post spokeswoman said that they “were replaced either due to wear and tear or because they were too small to meet the growing demand”. We do not know how many of the 97 historic boxes removed were dealt such a fate on the grounds of insufficient capacity. But given that there are no apparent differences in capacity between the historic and the new mailboxes, one must think not too many could have been removed for this reason. Moreover, even if capacity is really a concern, a more preservation-minded option would have been to erect another mailbox alongside the older box instead of removing the latter permanently. If capacity was not the main reason, it would have to be wear and tear. But then these historic boxes are all made of iron, which could have a very long life if given proper maintenance. In fact, in Britain there are still many postboxes from the Victorian era. Why are they still standing while Hong Kong’s historic boxes have deteriorated rapidly since 1997? Ms Chung explained that the box at Sok Kwu Wan, Lamma, had to be removed due to “serious internal rusting which caused extensive structural damage and even prevented the door hinges from functioning properly”. This would seem to have been preventable if constant and proper maintenance had been made to this historic relic before it was too late. 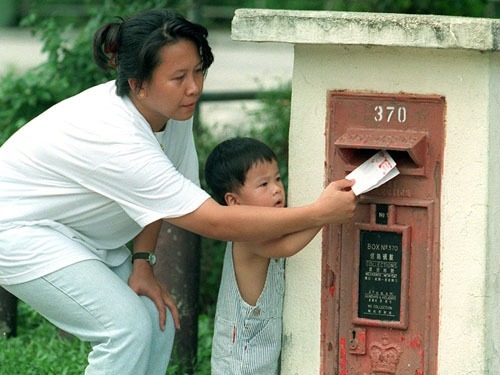 I urge Hongkong Post to review its policy of replacing these historic mailboxes on the grounds of insufficient capacity and maintenance problems. Given that there are only 47 of them left, the government’s Antiquities and Monuments Office should consider listing them as protected monuments. I refer to the letter from Sin Wai-man about the removal of postbox 256, at Sok Kwu Wan, on Lamma Island (“Historic mail box’s last post”, February 11). I would like to provide some relevant background information and clarifications. Despite its appearance, a closer examination conducted by our technicians in September last year revealed that the postbox was suffering from serious internal rusting which caused extensive structural damage and even prevented the door hinges from functioning properly. Major repair would have been necessary to restore the box to a workable condition, but doing so might jeopardise its physical characteristics and conservation value. We eventually came to a reluctant decision to replace it with one made of more durable materials. I wish to assure your readers that we at Hongkong Post are acutely aware of the need to preserve postal relics as part of our cultural heritage. Some good examples include the restoration of the old Stanley Post Office in 2007 and the amount of care taken to ensure that some 47 vintage postboxes bearing the royal insignia could continue to serve their duty with pride throughout different parts of Hong Kong. I was at Sok Kwu Wan, Lamma Island at the end of last month and thought I would check on a historic mail box that was from the King George V era. His reign was 1910 to 1936 so this mail box is at least 74 years old. However, sadly, I found it was under wraps and looked set to be removed soon. In a report you ran in March 2007 (“Keep historic mail boxes in service, experts urge”) a spokeswoman for Hongkong Post explained the reasons for removing the historic mail boxes, saying “they were replaced either due to wear and tear or because they were too small to meet the growing demand”. None of these reasons however seems applicable in the case of this Sok Kwu Wan mail box which had been kept in very good shape. Too many in our city have short memories of our history and we do not need the efforts of Hongkong Post to wipe these last remaining icons of a past era from our landscape. From a more pragmatic point of view, this KGV mail box is one of the oldest in Hong Kong. It could be promoted as a tourist attraction, so aside from historical and cultural reasons, there is a financial reason for preserving it.